Yoga for Athletes™ is the ideal exercise video complement for any sports enthusiast looking to build strength, stamina and flexibility. 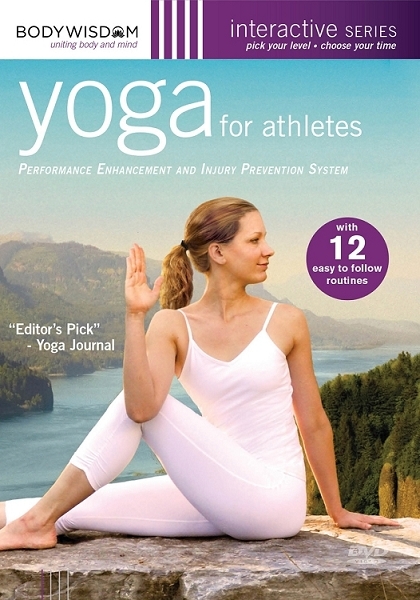 Whether a novice or experienced yoga practitioner, this yoga & fitness DVD will increase performance and help reduce the risk of sports related injuries. Choose from 16 different sports! Running, Tennis, Skiing, Golf, Soccer, Cycling, Swimming. Football, Basketball, Kayaking, Martial Arts, Rock Climbing, Hiking, Volleyball, Baseball, Weightlifting, each with 12 customized workouts Dozens of workouts to choose from! The Interactive Personal Trainer™ revolutionizes the practice of yoga in the home. Unlike other videos that may contain one or two workouts, this DVD contains dozens of workouts of varied lengths and purposes. Get into shape, relieve stress, become stronger and more flexible & increase energy with your own Interactive Personal Trainer™.